It’s been more or less sunny and dry here in Gothenburg since the beginning of May. Perhaps it’s a good idea to look at this photo from 10th August 2013 to remind ourselves: this year is abnormal. In 2013 it was less way out West, more Wet out West. 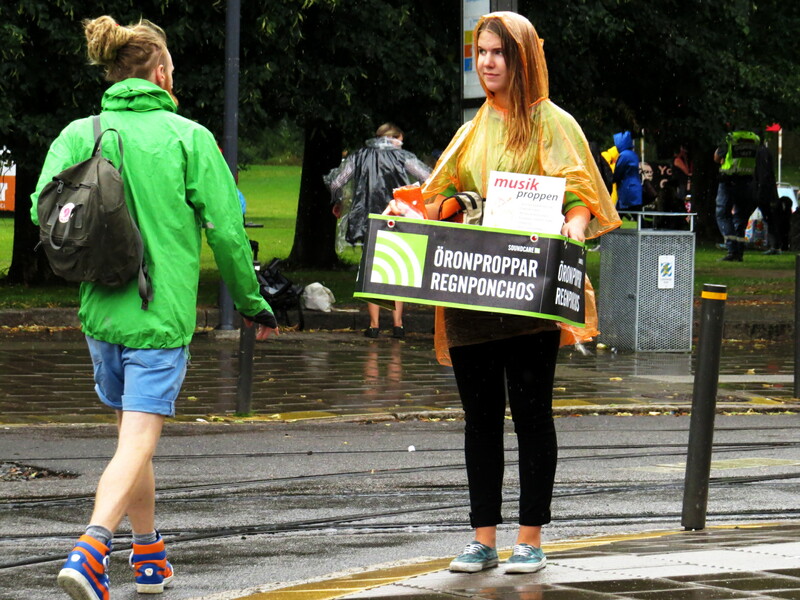 The photo shows a very wet young woman selling earplugs and rain ponchos at the entrance to Way out West. 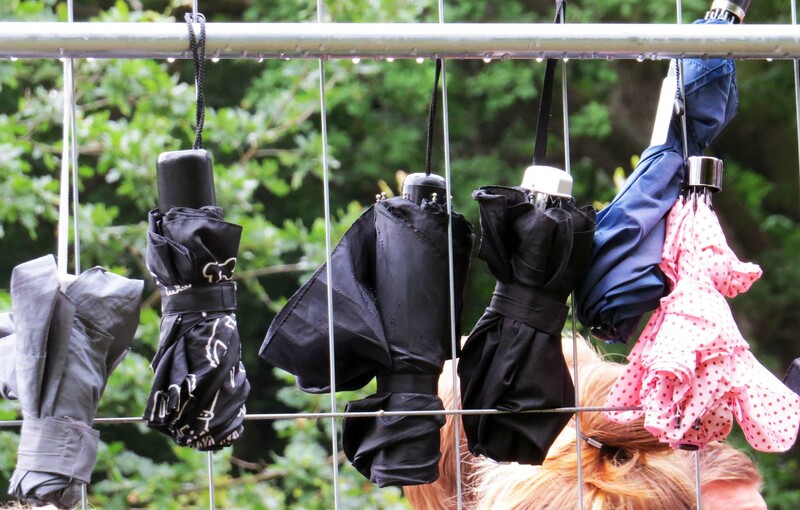 Way out West is is a three-day music festival that’s held in Gothenburg’s Slottskogen Park during August. It’s been running and growing for about 10 years now and is our biggest popular music festival. This year, the festival started on Thursday 9th August and will finish on Saturday 11th. This summer’s line up includes big names (Iggy Pop, Patti Smith, M.I.A. and Arctic Monkeys) as well as a very large number of other acts I am far too old and staid to recognise. All of this is made so much easier and more enjoyable if the weather is dry. Except that a) because everything is so dry there is a much increased fire risk and, b) the weather forecast for Friday and Saturday is stormy weather. So maybe the rain poncho is a good idea. The photo above I originally published along with the one below – so why separate them now? Umbrellas are forbidden at Way out West (because when they open they block the view). In 2013 people in line to enter were buying ponchos and hanging their umbrellas up on this fence.